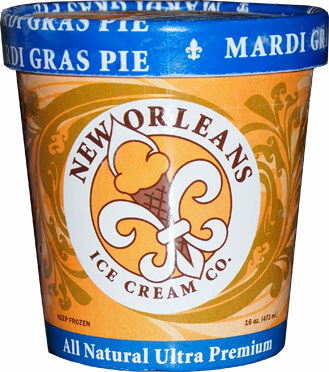 [New for 2013] When New Orleans ice cream company released the news that they were releasing a Mardi Gras Pie flavor this year, I was hoping they might contact me for a free sampling. Well, to my great amusement, they did, and now it's time to show you what they sent over. This may sound dumb, but I love the blue. I need to remember it for when I start up my ice cream company. 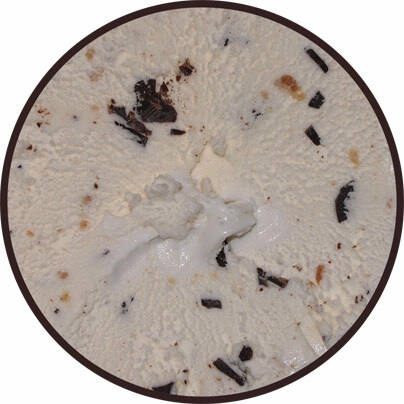 Anyway, New Orleans Mardi Gras Pie ice cream is "Mardi Gras in your mouth with this parade favorite - gooey marshmallow ice cream with marshmallow swirl, chocolate flakes & soft graham cracker. you'll be hollerin': "throw me one, mister!". That is one mighty description to have to live up to. I cant help myself, I take my first bite... and taste coconut?? what? I check the ingredients and there's a bit of coconut oil in the chocolate flakes but that's it. This is so weird. I don't taste marshmallow, I taste coconut! bummer!! Now don't lose hope. Let me say this again: I love the way this one looks. Sure, I expected more graham bits (I always do), but I still love the look of them and the various chocolate chips everywhere. It's just classic and so captivating. Ok, we have confirmation, my wife tastes coconut too (the difference is she doesn't care). It's not super strong or anything, but I can't convince myself that I taste otherwise. You could tell me this was coconut cream pie ice cream and I'd be like "umm, ok, nice job". As a marshmallow flavor though, I'm kind of at a loss for words. It's a real nice ice cream, I'm just totally confused right now. Well, somewhat confused because to be honest, I could go for another bowl of it right now. Good ice cream is good ice cream, no matter what the flavor is (within reason). On Second Pint: My wife happily finished off the first pint, so let's take a crack at the second pint and we'll just see what happens. I made a point to go real slow yet I still think I taste a hint of coconut, but I think I know why. 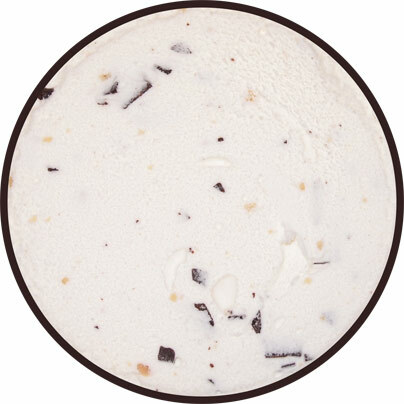 Somehow the marshmallow and graham have melded together to give this mellow, sweet coconut vibe. This pint has even more marshmallow swirl than the last so I wound up getting more of a gooey vibe this time. I want to apologize for my taste buds being confused on this one. This is an interesting flavor, my wife loves it, but to be honest I preferred this combination when it was balanced with some strawberry in their Baked Alaska. Buy Again? Mrs. Dubba says yes! On a note completely unrelated to ice cream but on the topic of graham flavored things, Land O'Lakes has a graham cracker flavored hot chocolate mix that tastes just like coconut. I taste no graham. I freaking love it, though.